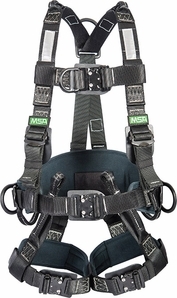 The brandnew MSA Gravity Utility Harness is a versatile full-body arc flash harness that can be used in a diverse number of applications such as confined space, rescue, transmission tower, telecom tower, rope access, and many others. This durable fall protection harness is suitable for electrical environments and has been tested for arc flash, and meets all requirements of ASTM F887 and ANSI Z359.1 standards. The Arc Flash Harness is equipped with PVC-coated d-rings in the back, hips, and chest area, quick-connect leg buckles with padding in legs and waist, kevlar backpad, nylon web, reflective striping, and rescue loops. The Utility Harness is available in Small, Medium and Large.